We are conveniently located at 22 Wales Street in downtown Rutland. 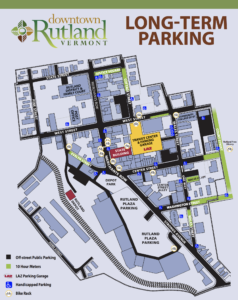 Getting to and parking downtown Rutland is easy and FREE. Right across the street from us is the Laz Parking Garage which you can access from WALES or WEST Street. Bring in your parking slip and we'll give you a pass with 100% validation and no time limit! Whether you plan to stay for a single class, several or stay and shop downtown after we have you covered! The parking garage is a secured clean facility with 24/7 camera surveillance and a full staff 7 days a week from 6am - 11pm that is covered from extreme weather conditions. There are a number of FREE off-street parking spaces as well as 2 hour and 10 hour meters.